Ontario’s Circular Economy Innovation Lab releases a vision for the future of printed paper and packaging in a low-carbon, circular economy. Toronto, ON, February 8, 2017 – The Natural Step Canada’s Ontario Circular Economy Innovation Lab (CEIL) is pleased to release its vision, framework and innovation pathways for the future of printed paper and packaging. This report outlines how we can achieve a waste-free future for printed paper and packaging in Ontario’s emerging circular economy. This publication is the result of CEIL’s Printed Paper and Packaging Rapid Lab which brought together 25 public and private sector leaders in a three-month “innovation lab” process to rethink how Ontario produces, uses and manages printed paper and packaging materials. These materials – ranging from bills, booklets and brochures to beverage and food containers, plastic bags and aluminum foil – are everywhere and impact every sector of the economy. The participants developed the vision over the course of three intensive workshops aimed at assessing the current state of printed paper and packaging in Ontario and the opportunities (and imperatives) of the circular economy. Functionality: Meeting market and regulatory requirements for function, branding, efficiency, safety, environment, performance and cost throughout the printed paper and packaging lifecycle. Rethinking waste and creating a circular economy culture in Ontario. Optimizing circular design and production processes for printed paper and packaging. Strengthening province-wide material recovery systems for all printed paper and packaging. 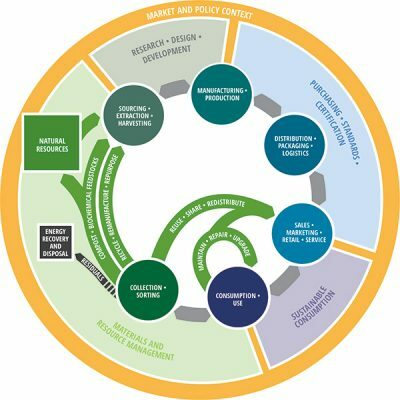 Adopting public and private sector policies that support the circular economy. Next up for CEIL is a 12-month fellowship program that allows Ontario innovators to tackle the circular economy across even more systems and sectors. Recruitment for the fellowship will begin in March with the group coming together in the fall. For more information visit www.circulareconomylab.com. The publication from CEIL’s Printed Paper and Packaging Rapid Lab is available at www.circulareconomylab.ca. CEIL is also offering a free webinar Building the circular economy for paper and packaging in Ontario from 12-1pm EST on February 21 (Register here). CEIL brings together private and public sector leaders and innovators from across Ontario to generate, test and implement circular economy solutions. Over the next four years CEIL will provide a platform for ongoing experimentation, innovation and collaboration leading to tangible breakthroughs that support Ontario’s transition to a circular economy. CEIL is powered by The Natural Step Canada with support from IKEA Canada, Unilever, the Ontario Waste Management Association, Owens Illinois Inc, Canadian Tire, Canada’s National Brewers, Smart Prosperity Institute, Celestica, the Bank of Montreal Financial Group, Interface, WP Warehousing Inc., the J.W. McConnell Family Foundation and the Government of Ontario.